Iron oxide pigments improve the physical and mechanical properties of substrates. They offer properties such as good color strength, heat & light stability, opacity, weather & chemical resistance, and durability to substrates. Iron oxide pigments provides colors to varieties of end user applications and are employed in numerous industries around the globe to provide permanent and stable coloring effects to the substrates. Pigments are also known as colorants, which are insoluble products that can be employed to impart colors to construction materials, paints, inks, plastics, papers, cosmetics, rubbers, concrete blocks, tiles, etc. Pigment molecules contain electrons that can occupy different energy levels when exposed to light. Pigments possess the ability to reflect or absorb light of specific wavelengths. This results in the appearance of colors. Iron oxide pigments are found in various colors and textures to impart coloring and tinting effects to majority of substrates. On the basis of consumption iron oxide pigments are sub-divided into red, yellow, and black colors. Red color iron oxide pigments are consumed in majority followed by yellow and black pigments. These are the basic color pigments and are used in combinations to produce other colors. The most commonly used methods of manufacturing iron oxide pigments includes the Laux process. This process can produce black, red, and yellow colored pigments of iron oxide. Red iron oxide pigments can also be prepared using the copperas process, which entails the calcination of iron sulfate at high temperature. Furthermore, the precipitation process can be implemented to manufacture red iron oxide pigments. Under this process, aqueous precipitation of iron oxide is formed in the presence of caustic soda under oxidative conditions. Iron oxide pigments can be sub-divided into synthetic and natural iron oxide pigments. Synthetic iron oxide pigments are made from petrochemicals and waste metal ore slurry. Synthetic iron oxide pigments are cheap as compared to organic iron oxide pigments owing to low cost of raw material as well as synthetic iron oxide pigments have good dispersibility, high tinting strength, UV stability, excellent color intensity, and non-toxic properties. Natural iron oxide pigments are costly as compared with its synthetic counterpart owing to high cost of raw material. Natural iron oxide pigments are more durable and have excellent tinting strength as compared with synthetic pigments. Most of the natural iron oxide pigments are employed in paints & coatings and other automotive applications. Consumption of synthetic iron oxide pigments is much higher as compared with natural iron oxide pigments owing to low cost and high flexibility in varieties of applications in concretes, mortar, render, paving stones, tiles, laminate flooring, cosmetics, rubber, corrosion paints, industrial paints, architectural paints, and plastic materials. Growing construction activities, recovering economy in developed countries, and expanding infrastructure programs in combination with growing urbanization in developing economies, are the prime factors responsible for the growing consumption of iron oxide pigments around the globe. Among the key regional markets, Asia Pacific showcases significantly high lucrative prospects. Meanwhile, the market witnessed decline in its shares for Latin America and Europe. In Asia Pacific, the market will benefit from rapid urbanization and the consequently rising demand from the construction and automotive industries. Besides these, various other factors are favoring the market’s growth in Asia Pacific. For instance, the market has considerably gained from easy availability of raw materials in the region. In addition, the manufacturing cost incurred in Asia Pacific is relatively lower as industries often find support of a growing economy and expanding construction and automotive sectors. Some of the key market players of iron oxide pigments market are Lanxess AG, BASF SE, Huntsman Corporation., E.I. du Pont de Nemours and Company, Heubach GmbH, Kronos Worldwide, Inc., Cathay Industries, Hunan Three-ring Pigments Co., Ltd., Tronox Ltd., Applied Minerals Inc., The Earth Pigments Company LLC., Tata Pigments Limited, NUBIOLA, and Titan Kogyo, Ltd.
Iron oxide pigments improve the physical and mechanical properties of substrates. They offer properties such as good color strength, heat & light stability, opacity, weather & chemical resistance, and durability to substrates. Iron oxide pigments provides colors to varieties of end user applications and are employed in numerous industries around the globe to provide permanent and stable coloring effects to the substrates. Pigments are also known as colorants, which are insoluble products that can be employed to impart colors to construction materials, paints, inks, plastics, papers, cosmetics, rubbers, concrete blocks, tiles, etc. Growing construction activities, recovering economy in developed countries, and expanding infrastructure programs in combination with growing urbanization in developing economies, are the prime factors responsible for the growing consumption of iron oxide pigments around the globe. Iron oxide pigments are found in various colors and textures to impart coloring and tinting effects to majority of substrates. On the basis of consumption iron oxide pigments are sub-divided into red, yellow, and black colors. Red color iron oxide pigments are consumed in majority followed by yellow and black pigments. These are the basic color pigments and are used in combinations to produce other colors. The most commonly used methods of manufacturing iron oxide pigments includes the Laux process. This process can produce black, red, and yellow colored pigments of iron oxide. Red iron oxide pigments can also be prepared using the copperas process, which entails the calcination of iron sulfate at high temperature. Raw material use for the red iron oxide pigments are the waste slurry of hematite, limonite, and iron hydroxide mineral ores. Growing environmental regulations regarding emissions and soil pollution would restrain the growth of the iron oxide pigments market in the forecasted period. Growing infrastructure projects, increasing demand of iron oxide pigments from automotive industry, and urbanization in developing countries would drive the market for iron oxide pigments around the globe. The report estimates and forecasts the Iron oxide Pigments market on the global and regional levels. The study provides forecast between 2017 and 2025 based on volume (Kilo Tons) & revenue (US$ Mn) with 2016 as the base year. The report comprises an exhaustive value chain analysis for each of the segments with detailed iron oxide manufacturing process. It provides a comprehensive view of the market. Value chain analysis also offers detailed information about value addition at each stage with list of major customers. The study includes drivers and restraints for the Iron oxide Pigments market along with their impact on demand during the forecast period. The study also provides key market indicators affecting the growth of the market. The report analyzes opportunities in the Iron oxide Pigments market on the global and regional level. Drivers, restraints, and key trends mentioned in the report are justified through quantitative and qualitative data. These have been verified through primary and secondary resources. Furthermore, the report analyzes production scenario of Iron oxide Pigments and global import- export analysis. The report includes Porter’s Five Forces Model to determine the degree of competition in the Iron oxide Pigments market. The report comprises a qualitative write-up on market attractiveness analysis, wherein end-users and regions have been analyzed based on attractiveness for each region. Growth rate, market size, raw material availability, profit margin, impact strength, technology, competition, and other factors (such as environmental and legal) have been evaluated in order to derive the general attractiveness of the market. 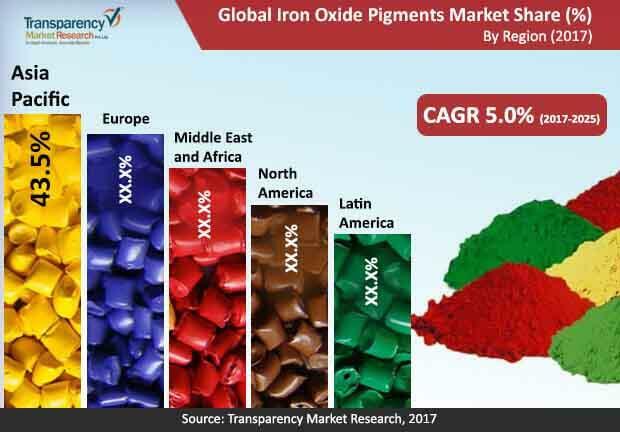 The study provides a comprehensive view of the Iron oxide Pigments market by dividing it into Iron oxide Pigments by color type, by type, by end-use application, and by geography segments. The Iron oxide Pigments market by color type has been segmented into below red, yellow, black, and other sub-segments. The type segment is divided into synthetic and natural sub segments. The end-use application type segment is divided into construction, paints & coatings, textiles, inks, plastics, and others sub-segments. These segments have been analyzed based on historic, present, and future trends. Regional segmentation includes the current and forecast consumption of Iron oxide Pigments in North America, Latin America, Europe, Asia Pacific, and Middle East & Africa (MEA). Market segmentation includes demand for consumption in all the regions individually. Secondary research sources that were typically referred to include, but were not limited to, European Printing Ink Association, U.S. Environmental Protection Agency, Color Pigments Manufacturers Association, Inc. (CPMA), The European Chemical Industry Council, World Paint & Coatings Industry Association (WPCIA), United States Geological Society (USGS), National Institute of Occupational Safety and Health (NIOSH), company websites, financial reports, annual reports, investor presentations, broker reports, and SEC filings. Other sources such as internal and external proprietary databases, statistical databases and market reports, news articles, national government documents, and webcasts specific to companies operating in the market have also been referred for the report. The report covers detailed competitive outlook that includes market share and profiles of key players operating in the global Iron oxide Pigments market. Key players profiled in the report are Lanxess AG, BASF SE, Huntsman Corporation., E.I. du Pont de Nemours and Company, Heubach GmbH, Kronos Worldwide, Inc., Cathay Industries, Hunan Three-ring Pigments Co., Ltd., Tronox Ltd., Applied Minerals Inc., The Earth Pigments Company LLC., Tata Pigments Limited, NUBIOLA, and Titan Kogyo, Ltd. Company profiles include attributes such as company overview, number of employees, brand overview, key competitors, business overview, business strategies, recent/key developments, acquisitions, and financial overview (wherever applicable).